Customizability is one of the key features that makes Android OS stand out from the rest. Of course, you get a home screen on Android which you won’t find on your iPhone (oops!). So, clearly, you have the ability to add widgets to your screen to make the most out of your Android device. Well, you do not have to head outside or install a weather app to keep track of the weather, only install the best weather widgets for Android to make things easier. One might say that weather widgets do drain a lot of battery because they continuously run and update the information to let the user keep track of the latest information. Well, that’s a yes, but not necessarily. It will drain more battery than your average usage, but not as much as you would expect it to ruin a day of usage! So, without wasting much of your time, let’s move on to know about the best weather widgets for Android. 1Weather is one of the best weather widgets for Android. It offers a great user interface that makes us forget for a moment that it’s primarily meant to act as a widget. Upon starting 1Weather, you’ll be able to observe smooth transition effects which provide a rich experience. The developers have implemented a material design interface in an impressive manner. Of course, you can add a widget to your home screen, but in case you don’t want to make a mess of your home screen (some clean Android home screen lovers), you can just launch the app to get a complete glance of the weather with great details as well. It gives you the ability to view forecasts hourly, 1.5 days, 10 days, and a whopping 12 weeks in association with a renowned meteorologist. You can also track the Sunrise time and the sunset time. To get started, set your current location or any other desired location of your choice to get real-time updates on the weather. If you are in the U.S, you can get severe weather alerts from the National Weather Service directly through this Android weather widget app. Also, it lets you check the temperature, shows the forecast for precipitation, and also presents you with a form of Doppler radar. The Weather & Clock Widget by Devexpert.NET sits as a widget on your device, unlike Weather1. The widgets offered with the app are crisp to look at and are available in a wide range of sizes & styles to choose from. Well, maybe, some of the widget styles might look classic to you (older widget styles). However, in comparison to heavy widget apps for Android available on the Play Store, it proves to be a lighter alternative giving out the same amount details for the weather. Along with the weather information, you can get the date/time displayed as well. So, if you were searching for a clock widget app for Android, this could serve well for that use as well. This weather widget app for Android lets you check the temperature, dew points, ultraviolet index, wind speed, and directions. Besides, you can also add calendar events and a battery icon as well along with the forecast information. AccuWeather is not a primary an Android widget app, but it is one of the best weather apps for Android out there. It is known for its accurate readings and some exclusive free features on the app. AccuWeather lets you know the exact local weather information which proves to be accurate most of the time. It incorporates an exclusive feature – AccuWeather MinuteCast, which gives you minute-to-minute precipitation forecast. AccuWeather can push notifications to your device for severe weather alerts (U.S only). Surprisingly, it also lets us know about the intensity of the precipitation and the type. Besides, it also provides you a section of current news and videos to stay updated with the same. You also get the ability to store an unlimited number of locations. Weather Live app is one of the most loved weather widget apps for Android because of its custom widgets on your home screen. The widgets are gorgeous and present a rich user experience whenever you turn on the screen. Not only the widgets are good looking, but they also present a lot of details on it. Also, you can set an animated wallpaper on your home screen to stay tuned to the weather situation. It lets you check the temperature, 7-days & 24-hours forecast, and get visibility details as well. You also get an additional status bar through which you can keep track of the weather information without leaving your task. It is also compatible with Android Wearables like the Moto 360, Sony Smartwatch 3, Samsung Gear live, and the LG G Watch. 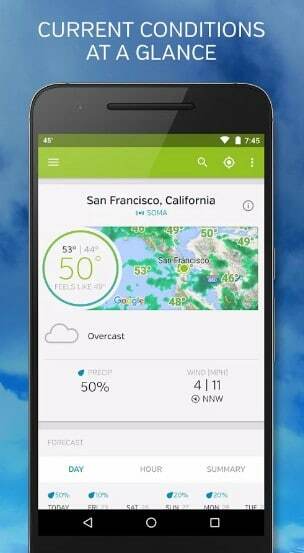 Weather Underground is yet another excellent Android weather app to keep track of the weather. It’s a standalone weather app for Android which gives you the option to add custom widgets on your home screen as well. The custom widgets look damn appealing, and you’ll know when you’ll install it. The user interface offering seems quite polished and provides a good user experience. Do note that Weather Underground is something unique which partly stands out of the crowd. It utilizes a crowd-sourced database which provides you a lot of detailed information from specific areas where the big shot meteorological team fails to reach or track. It lets you check the temperature, get access to an interactive map, 10-days forecast, and gives you a status notification as well. Yahoo weather sits tight on the Play Store for a long time. There’s nothing much fancy we can discuss here. However, like any other weather widgets for Android, it gives you a pretty accurate weather information as well. Well, maybe, it isn’t as accurate as AccuWeather. Of course, Yahoo isn’t known for weather reporting, but if you want to track the weather information for a location that’s far off, it might not be a useful addition to your device. Given the fact with my experience, I did not get the correct weather details when compared to other applications for my location. So, you’ll have to check whether it works for your location or not. Overall, if it does work at your location, it’s a smooth weather widgets app for Android which offers quite basic yet decent widgets for your home screen. 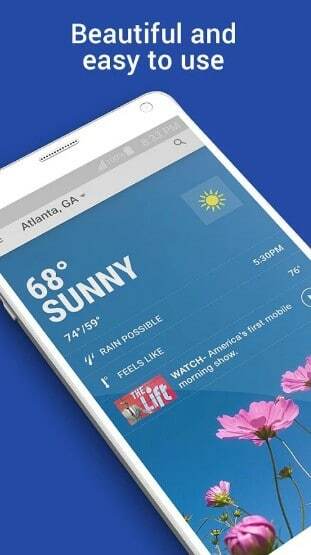 The Weather Channel unquestionably presents you with the most trusted information from across the world at your fingertips. It offers you almost every feature that you can find on other competing weather widgets for Android available on the Play Store. There’s even more than meets the eye. It comes baked in with a dynamic home screen, forecasts, real-time weather conditions, weather maps, and hurricane central. To keep you updated with every possible weather alerts, it provides severe weather alerts, breaking news alerts, lightning alerts, rain and snow alerts, and pollen alerts. 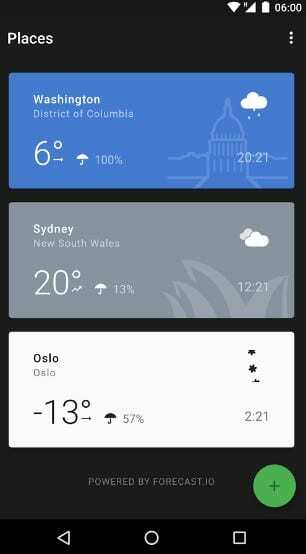 Weather Timeline is a quite simple forecast weather application for Android that offers custom widgets to place on your home screen as well. I must mention that the widgets provided here are damn gorgeous to look at. The widgets offered here is as good as the primary user interface of the app. It also comes with the support for Android wearables. Besides, it also presents you with a time machine forecast feature which provides you weather information for months/years in advance. So, now you know of several weather apps that offer you a variety of weather widgets for Android that you can place on your home screen. There’s everything for you. If you want a basic weather widget on your home screen, Weather & Clock Widget by Devexpert.NET will help. 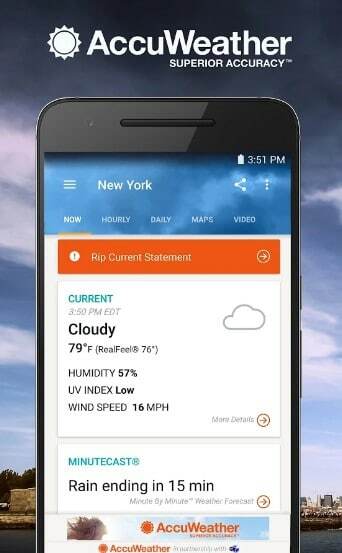 If you are looking for the best weather information without considering how good the weather widget looks, you can try AccuWeather or The Weather Channel. On the off chance, if you want to spend a dollar to get a great weather app providing an excellent user interface for the widgets, try Weather Timeline. 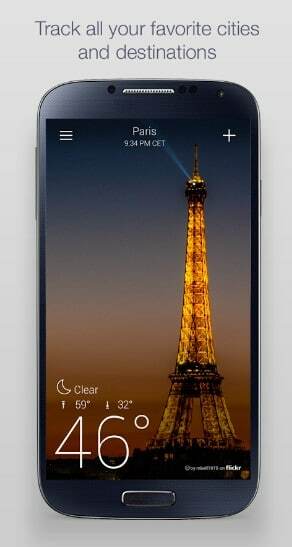 For a mixed preference of features and user interface, you have Yahoo Weather, Weather Underground, Weather Live & Weather1. Did we miss any of your favorites? Is there a better weather app for Android which offers a fantastic set of widgets for your home screen? Let us know in the comments below.